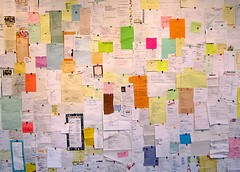 700+ grocery lists tacked to a wall! This grocery lists collection is part of my new exhibit called Junk Science: Found objects, trash photography, strange collections and accidental art. It’s based on my many years of web projects at keaggy.com and here at grocerylists.org. You’ll get to see more than 700 of these lists (plus a lot of photography) on display at COCA (the Center of Creative Arts) at 524 Trinity in the University City area of St. louis, Missouri. I’d love for a bunch of folks to be there for the opening, which is Friday, April 14, 2006 — from 6-8 p.m.